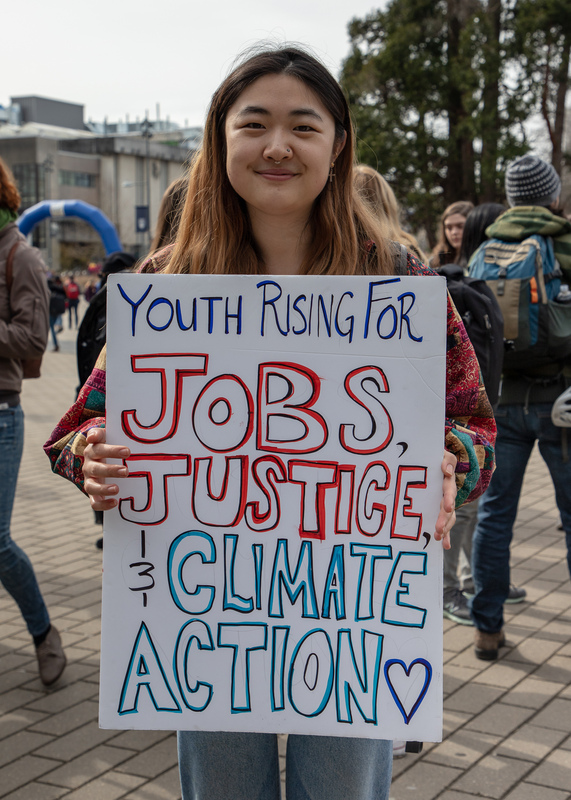 UBC students gathered outside the Nest on Friday for the School Strike for Climate Emergency, part of a larger global youth movement to demand action on climate change from political leaders. The event was co-hosted by fourth-year history student and former AMS presidential candidate Spencer Latu, who said he was inspired to create the event with campus climate group UBCC350 after reading about the movement in a magazine. 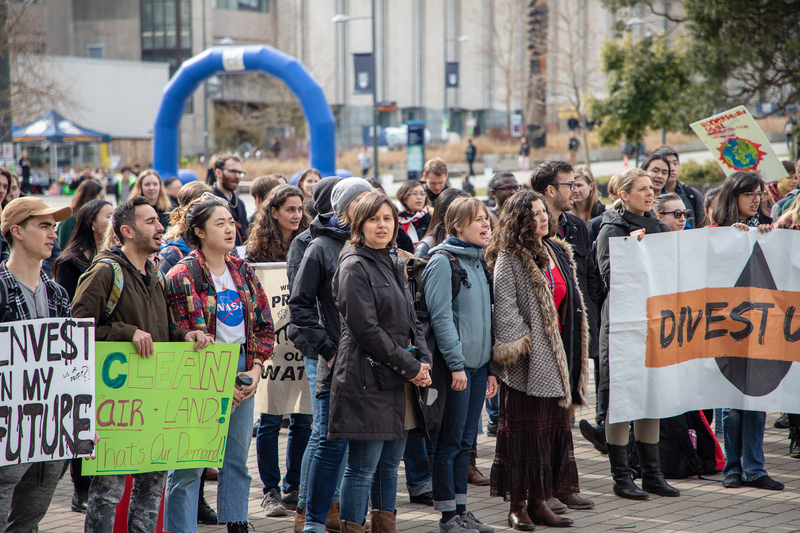 He says it’s a way to stand in solidarity with global climate movements and connect them to issues facing UBC campus, like the ongoing push for divestment at UBC. “What’s going on on campus feels like it's not connected to what's going on in the world,” Latu said. The event began with speeches and chants led by members of UBCC350. Shouts of “we won’t rest until UBC divests” and “climate strike” echoed throughout the Nest plaza. Latu says he hopes students attending the event find a community of like-minded people who care about climate change and are concerned about inaction from political leaders. “I think it’s going to be really great when people come down outside of the Nest and recognize that, ‘Hey, it's not just me that feels this way’… All these other students can recognize that their futures are in jeopardy for the profits of a very small group of people,” he said. Students attending the event echoed Latu’s feelings of urgency. 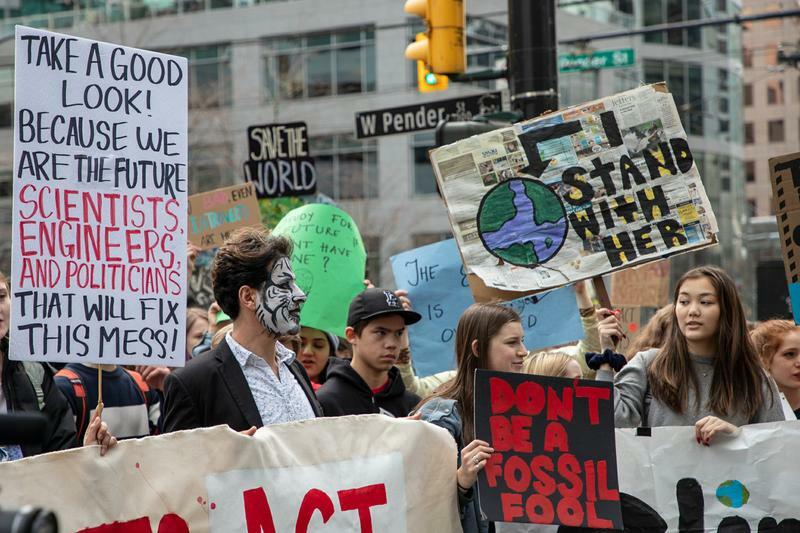 Fifth-year forestry student Sophia Lang said her experience attending the UN Climate Conference in December inspired her to come out to the climate strike. “I was so angry because I was seeing all the progress and all the information young people had, but big corporations and big oil money and industry and also government officials were not interested in speeding up the pace of what needs to be done,” she said. After the event, many UBC students joined the larger event downtown. Hundreds of students from Vancouver universities and high schools filled into the šxʷƛ̓ənəq Xwtl’e7énḵ Square calling for climate action. The crowd then marched to the Environment and Climate Change Canada building where more chanting took place. Adults and parents with young children also joined in the youth demonstration. Latu says the event was especially important for students, as climate change will have the most direct impact on their futures as they grow older. “I think it's our responsibility as students of a Canadian university to hold our own federal government accountable to their promises,” he said. He also pushed back against the AMS’s ‘quiet activism’ recently described in a Ubyssey feature, saying it was time for direct confrontation with university administrators. He urged students to take the lead on progressive social movements, and advocated for a bottom-up approach to forming university policy. “As powerful as the AMS, as powerful as the Board of Governors is, maybe it's got to come from the students themselves,” Latu said. This article has been updated to correct the downtown location.